It’s hard enough to live on your pay without having your wages garnished. Don’t face garnishments alone. In today’s troubling economic climate, it has become more common than ever to fall behind on your payments and find yourself on the wrong end of a garnishment proceeding. Fortunately, you may have options in dealing with the garnishment, both before and after the garnishment starts — options that can save you your hard-earned money and help you provide for yourself and family. Filing bankruptcy and stopping any further garnishing of your wages. The attorneys at the Law Office of Kenneth P. Carp understand the garnishment process. With more than 20 years of legal experience, our St. Louis-based firm strives to provide detailed guidance to clients in Missouri. Attorney Kenneth Carp strives to offer the detailed advice you need to understand your various options. Contact us to schedule a free consultation to discuss your specific concerns and learn how we can be of assistance. The attorneys at The Law Office of Kenneth P. Carp know the rules of credit reporting and debtor assistance and get them to work for you. 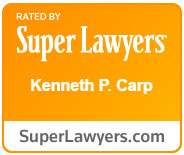 With over 20 years of court experience our senior attorney Kenneth Carp, a retired Lt. Colonel with the U.S. Air Force, has the right experience to represent you. Call (636) 947-3600.